Sorry about the delay, fellow readers I had “flu-like symptoms” most of last week, likely this was caused by excessive liver damage done by ESPN to my body. Following the “NFL Live” and “Insiders” shows, both of which were duds, on came Outside The Lines (OTL). This show was pretty good, a journalistic type show that does deep dives into scandals or issues of our time in sports. It is only a half hour show and I guess it only airs a new show once a week. This is a mistake, share this show with the world, and do a new recording daily. This is what journalism should look like. After OTL the “Happy Hour presented by Captain Morgan” began to air. I didn’t find a single watchable show during this two hour block. Pardon the Interruption, Around the Horn, His and Hers (more on this bust later) and Highly Questionable are just that, highly questionable TV. His and Hers, and Highly Questionable was just a bunch of race baiting done by hosts trying to get viewers riled up. Both shows could and should be canceled, neither was. Pardon the interruption and Around the Horn featured sports talk similar to political cross talk you see on MSNBC or Fox now. Mostly screaming, inaudible television, featuring people trying to talk over one another, nothing to see or hear in this hour. Mercifully “Happy Hour presented by Captain Morgan” was over, again severe damage was done to X’s liver, and ear drums from the loud shouting. Next on the self proclaimed “World Wide Leader” was SC:6 or Sports Center at 6pm eastern. This was hosted by resident Race Baiters Jemele Hill and Michael Smith, same hosts of His and Hers. This Sports Center—just like the Happy Hour show—was a complete waste of resources, talent and TV time. Perhaps what was even worse was that the shows followed a national news network philosophy where when a new show started the same topics were rehashed. This makes for boring predictable TV. Live sports took over from about 5pm until 9 pm then the madness continued. Sports Center at Night (9pm) with Scott Van Pelt was awesome theatre, highlights, mixed with guest commentary, mixed with analysis and personal opinion, I loved it! Like a throwback to the old sports center where ESPN buttered their bread. So if you’re tuning into ESPN try Sports Center at Night with SVP. After Sports Center at Night, we were back to strange cross talk again. We had Baseball Tonight, it lasted one hour and was filled with random movie jargon from host Adnan Virk. Honestly it was odd, very little baseball discussion and if I didn’t know better, I would have thought I changed the channel without knowing. 30 for 30 followed next, very good stuff, on par with OTL but instead of current event reporting more of reporting in depth on things that happened in the past, such as the Michigan Fab 5 scandal. Much like OTL this is a once a week or even sometimes bi-monthly show. I would expand on this, great stuff. More Sports Center followed this program, and I decided I needed to hit the sheets as it was dreadful. Sports Center Live from Los Angeles it was called. Hosted by Stan Verrett and Neil Everett, and trust me it was strange television, like creepy stoner television. Had a strange episode discussing hockey called “Barry’s Bistro” with colleague Barry Melrose, like I said bizarre. It’s very clear the network has far more issues with its declining viewership than just the need to lay off 100 anchors. The liberal bias that William and I have detailed over the months is still present, albeit even after said layoffs occurred, anchor Linda Cohn even admitted it. ESPN made bad bets on the sports of basketball and baseball; they are dying and very unpopular with the younger crowd. Basketball could be an exception, as the younger crowd seems to like the showboating and the fact some teams are considered super teams. Football may be king, but the ratings for Monday Night Football, (rights owned by ESPN) were a disaster. So bad they are throwing the “right a bone” and hiring back Hank Williams Jr. to sing the opening again. Also they announced hiring conservative columnist Will Cain, not really sure why but…okay? Cheap thrills, probably won’t work, in an era where we get football on Thursday night, then all day Sunday, we are footballed out on Monday. Now into the layoffs, sorry for the rambling column but some really talented folks lost their paychecks last month. The list includes but is not limited too; Ed Werder, John Clayton, Jayson Stark, Andy Katz, Chad Ford, Sarah Walsh (upon returning from maternity leave) and Danny Kannell. Werder and Ford were asked to stick around and cover the NFL and NBA draft respectively, Werder said “no, thanks” can’t blame him. Several names on the list were thought highly of by X, others not so much, these were those let go I will not shed a tear for; Roger Cossack was a know nothing legal analyst that got the Barry Bonds scandal all wrong…bye! Britt McHenry, she was human scum and literal trash, just Google her name. Len Elmore, he is a race baiting clown, please go away. Rest assured more layoffs are going to come in future years; you cannot have poor ratings, race baiting and continue on as a profitable organization. Now, my solution, I would get rid of all the race-baiting idiots that somehow survived the cut down, I’m looking at you Bomani Jones. I would make Scott Van Pelt and Mike Greenberg the people I would build around. Give them both two hour long programs; for Van Pelt, his commentaries mixed in with highlights are amazing. Greenberg has a news breaking persona, give him a morning show and let him re-hash yesterday’s events and interview a star or two or five. Have OTL and 30 for 30 air more often, they are both great journalistic type shows. You can keep some of the back and forth bantering shows, but I would cut them back, these shows are alienating the older viewers. Have more one sport type shows such as the cancelled “Baseball Tonight” show, but do highlights of all games, and commentary from all games, not just games played in very large markets, again you are alienating people. Have Sports Center air more often, again focus on highlights, and inject breaking news, kinda like a real news show. 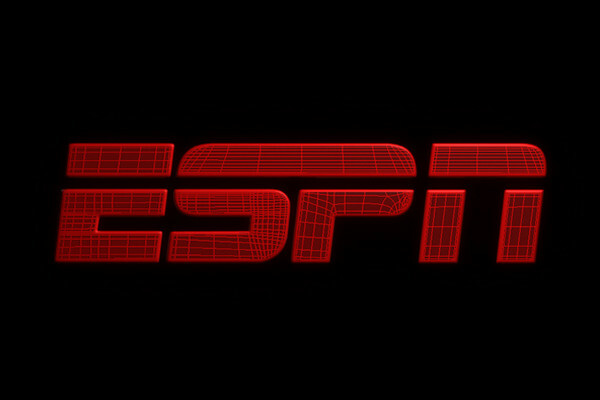 Lastly get rid of the live sports, mostly all the college football, they show like literally every game, seriously when I watched “Dodgeball” I thought ESPN 8 “The Ocho” was fantasy land, now I wonder if there’s an ESPN 10. Showing games like Oregon State versus Wichita State isn’t moving many needles I don’t think, leave that to regional networks. Finally here’s what I’m most upset about, the definition of luck has been redefined, why ESPN didn’t get rid of this anchor….. 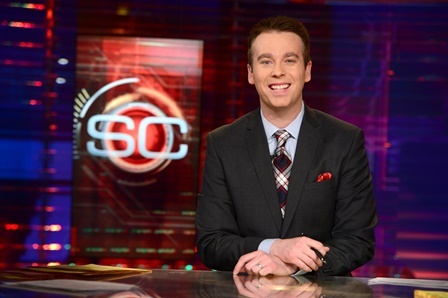 I don’t know his name but I always can find him by googling “ESPN Howdy Doody A**BAG with painted on eyebrows! But seriously, the layoffs were done by phone call lasting just 3 minutes, most of those laid off….spent decades in ESPN. Those in NBA and NHL (Hockey) were let go during the playoffs. Those in NFL let go literally a day before the NFL draft, yeah, ok I guess. Buffet…..you’re next; I’m coming after your Kraft Heinz subsidiary next week!